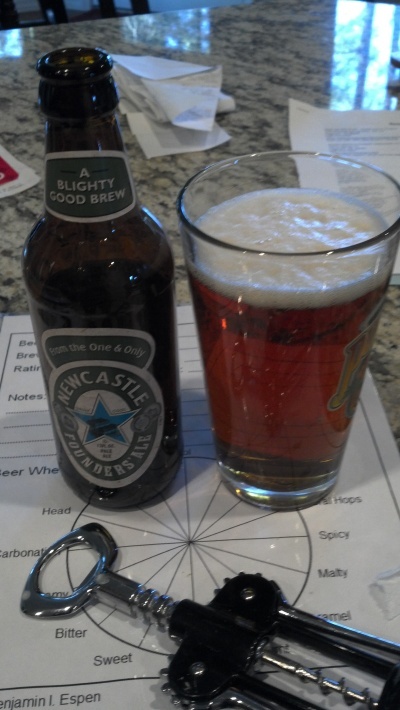 First beer review in the new house, and first with the new rating template! Still working on the template, but the beer was excellent. Another of Newcastle's Limited Edition brews, this one commemorates the five founding breweries that became Newcastle. In their honor, a traditional Extra Stout Bitter has been brewed. Called a bitter because it is a pale ale, and extra stout because of the amount of alcohol present (4.8% or greater). Despite being called a bitter, it is actually quite sweet and mild. A pleasant drinking beer. Poured reddish, with a short creamy white head. The flavor is mild hops and mild malts, sweet but not sickly, and definitely not bitter. I could do with more pale ales like this one.